Howlin' Wolf Records: SIX STRINGS: Bear McCreary receives nod on his score for STARZ’s Original hit series ‘Outlander’!! 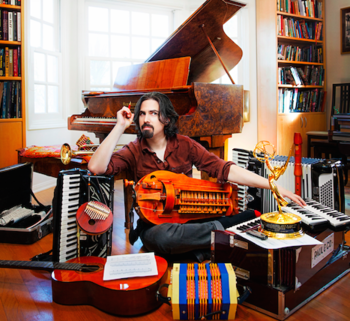 Bear McCreary receives nod on his score for STARZ’s Original hit series ‘Outlander’!! On July 16th, the Television Academy announced the nominations for the 67th annual Primetime EMMY® Awards. Bear McCreary received his nomination in Outstanding Music Composition For A Series (Original Dramatic Score) for Outlander. McCreary earned his first EMMY Award for his main title theme for STARZ’s Da Vinci’s Demons in 2013. He earned his third EMMY nomination in 2014 for STARZ’s Black Sails and this is the third year in a row McCreary has been nominated for his work on a STARZ television series. This is the only category Outlander has been nominated in for this year’s EMMY® Awards. This is great news for one of our favorite composers Bear McCreary, congratulations to him and all those help get the music out to us. Bear McCreary is represented by Beth Krakower of Krakower Poling Public Relations. Congratulations To him since he's a very talented composer.